Album This song officially appears on the FourFiveSeconds Single. “FourFiveSeconds” is a “country-tinged” acoustic and “stripped down” pop song with a folk feel and a length of three minutes and eight seconds. 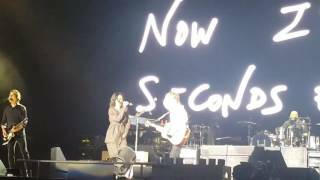 “FourFiveSeconds” features a simple instrumentation consisting of only an acoustic guitar and organ, while it’s also accompanied by a cello in the background. 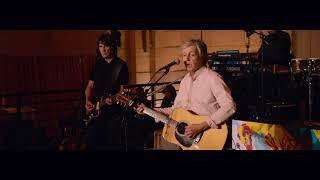 Instead of being rapped, West’s lines are sung, while McCartney only plays the instruments. Billboard’s Jocelyn Vena stated that the sound of the single represents a departure from the material present on Rihanna’s 2012 studio album, Unapologetic. Hugh Mclntyre of Forbes agreed with Vena who also stated that it “is a complete departure for both Rihanna and Kanye West, though it does fit McCartney’s style“. Lanre Bakare of The Guardian called the song an “acoustic ballad” and agreed that the song is a departure from Rihanna and West’s previous collaborations. Alex Frank of Vogue magazine described “FourFiveSeconds” as an unplugged version of Rihanna’s 2011 single “We Found Love“, without the dance beats, present on her previous singles. “FourFiveSeconds” received rave reviews from music critics. 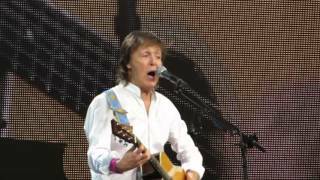 Peter Kandunias of Gigwise praised Rihanna’s and West’s vocals and also McCartney’s play of the instruments in the song. Mclntyre of Forbes specifically praised Rihanna’s vocals and wrote that the spotlight is on them and are highlighted in a way they can not be on her “club-ready, bombastic tunes“. Jim Farber of New York Daily News praised the collaboration and stated that it’s better than the previous West-McCartney collaboration. Additionally, he praised Rihanna’s vocals and stated that they are a lot better than West’s, “who could have used more auto-tune to firm his unsteady vocals” Farber further noted, “It’s refreshing to hear Rihanna sing with so little affect, in a setting that’s much less processed than most of her recordings“. Vox’s Kelsey McKinney noted that Rihanna’s voice presents growth in range and tone since her last album, and it’s more vulnerable than we’ve heard Rihanna since the 2013 single “Stay“. According to him, the song hints that her new album could have more confessional slow songs like “FourFiveSeconds“. Spencer Kornhaber of The Atlantic also praised Rihanna’s vocals, writing, “Listen to the ragged squeak in her voice in the first verse, and how she maintains control as she alternates between contemplative trills and gospel shouts during the bridge“. According to him, the song showcases the distinctiveness of her timbre and phrasing is, something that wasn’t heard on her previous songs like the 2010 single “Only Girl (In the World)“. Travis Grier of Def Pen Radio thought that the song is a right choice for Rihanna to achieve legendary status, as, “she’s tackled pretty much every genre under the sun and ‘FourFiveSeconds’ just expands her versatility even more“. Crotty of Elle wrote that the song is “awesome” and “sweet“. “FourFiveSeconds” has been played in 90 concerts and 1 soundchecks.